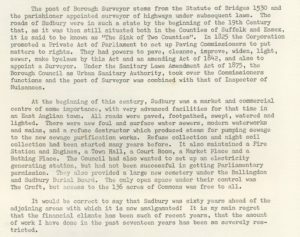 In 1974 the restructuring of local government after the Maud Report changed the way Sudbury was managed. Sudbury still has a Mayor and town council – the Mayor wears the ancient mayoral chain and attends civic occasions dressed in the red robe and black hat. 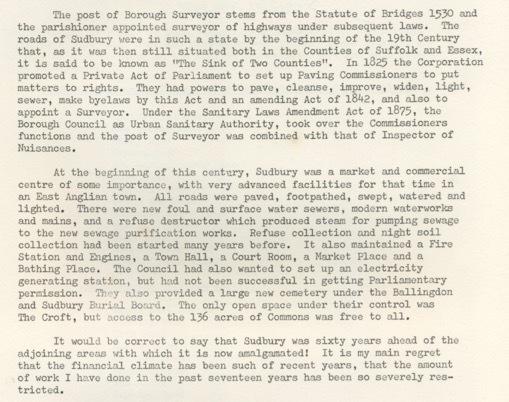 In the Sudbury Ephemera Archive there are copies of some interesting minutes and reports delivered to the council. 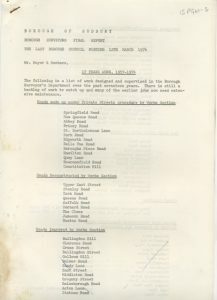 One of the last meetings of the council before the reorganisation records that even in 1974 questions were being raised about burning electricity for street lighting during the night when it was expected that residents were asleep. Of course in 1904 the town was not lit by electricity but gas and these had to be ignited and adjusted by a person who was employed for this duty. 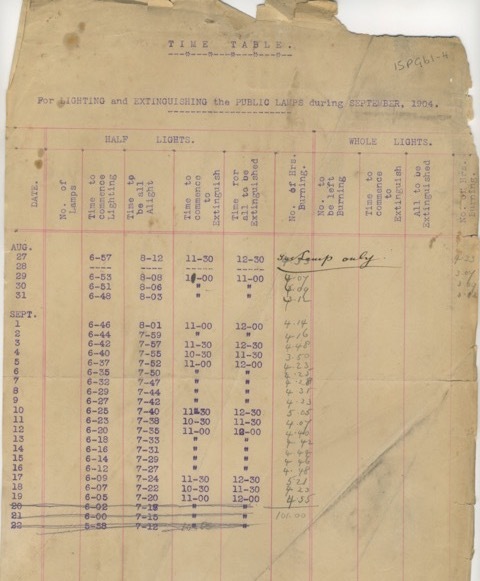 The image below shows the timetable for lighting and extinguishing the lamps in Sudbury in August and September 1904. The same meeting discussed the possibility of granting financial assistance towards the provision of a separate water service pipe to a residence in Waldingfield Road. Two other matters raised at the meeting which have a familiar ring today were the condition of the town pavements and the need to have an office in the town for residents to be able to make contact with Babergh District Council. 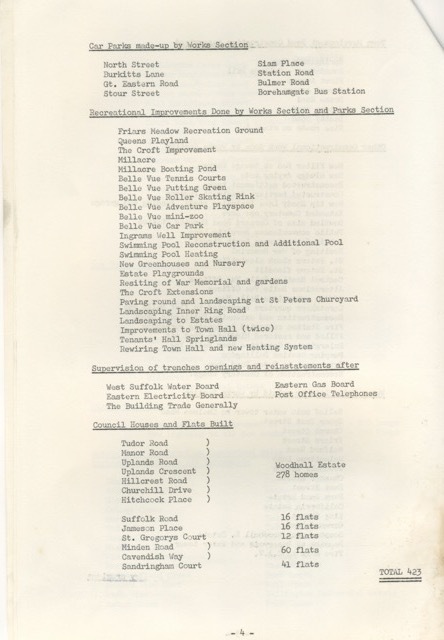 The Borough Surveyor prepared a report for the last Borough Council meeting held on 12th March 1974, in which he outlined the work covered by his department between 1957 and 1974. 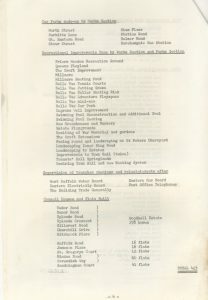 A report about traffic and pedestrians and the need to review the situation was produced in 1967, which coincided with the expansion of the town and relocation of businesses and the influx of the workforce from London. 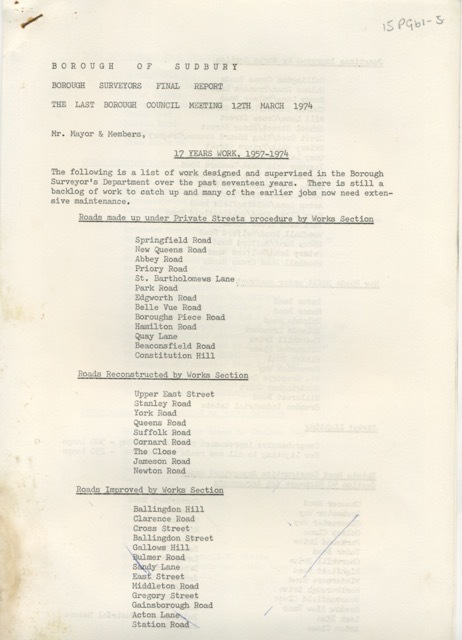 One document discusses the siting of the bus station and suggests the possibility of the buses being terminated around the Croft. 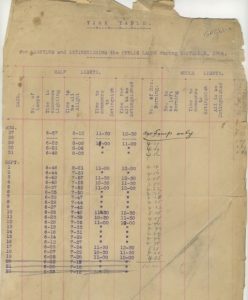 These are just a few of the subjects included with copies of the papers produced by the Borough Surveyor and stored in the archive. SEA also holds details about the sewage and pumping station.